The cow jaw bone found at depth of 6’-8’ near the future Wilshire/La Cienega Station. Photos: L.A. Metro. 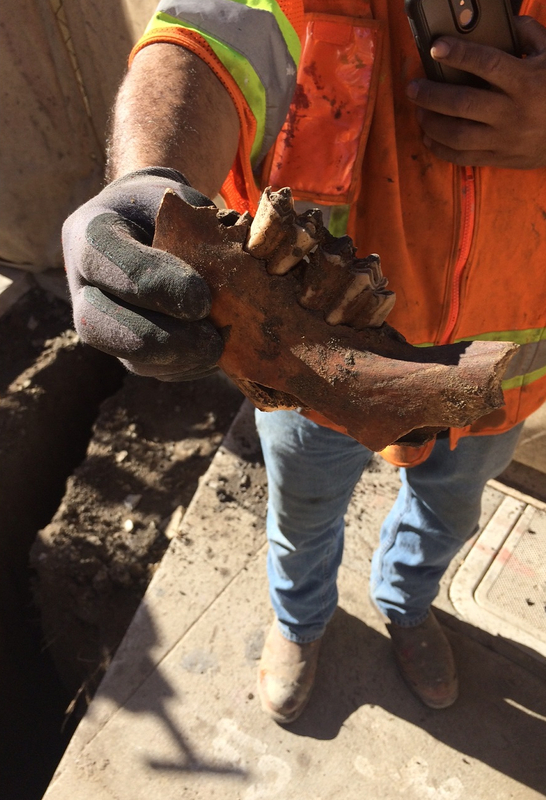 Recently — and to their surprise — Metro contractors found a late 19th Century jaw bone from a cow about six to eight feet below Wilshire Boulevard near the future Wilshire/La Cienega Station for the Purple Line Extension. Unlike some of the Pleistocene-era fossils found as part of the project, this one isn’t that old. But it’s certainly interesting. This is not the first discovery involving ranching history in Beverly Hills. During pre-construction for the project in Dec. 2015, paleontologists found a partial cow skeleton with portions of the spine, forelimb and hind limb intact. And this past April, workers found a shovel blade, two horseshoes, one long bar and one bolt — likely components of a wagon — along with other bits and pieces of century-old ranching and farming tools (see the pics below). The site of the future Wilshire/La Cienega Station was once part of the 4,539-acre Rancho Rodeo de la Aguas until the late 1800s, according to “Land in California, the Story of Mission Lands, Ranchos, Squatters, Mining Claims, Railroad Grants, Land Scrip and Homesteads.” Beverly Hills began zoning vacant land for commercial use in the early 1900s. As major construction activities continue at Wilshire/La Cienega, more discoveries are expected that will help add to our region’s historical record. 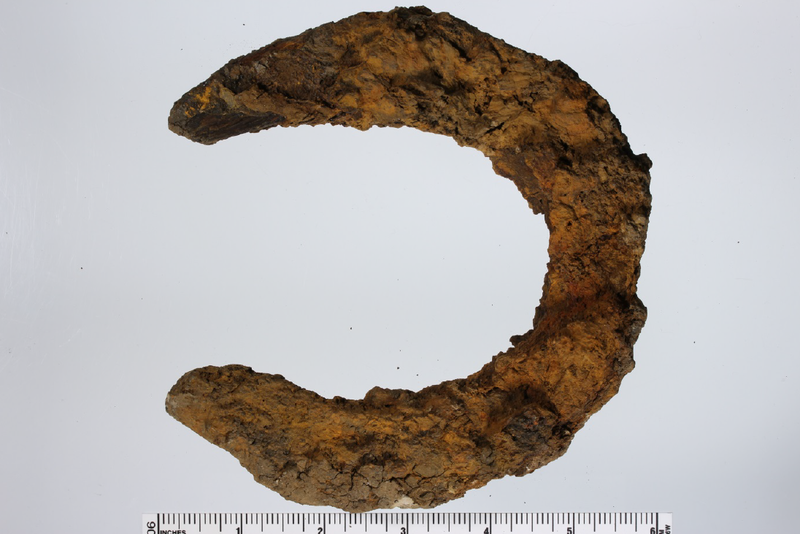 A heavy horseshoe for a horse’s front foot. A round-nose shovel blade and partial handle. What I question is tunneling passed the La Brea tap Pits. I know for a fact the tar pits do not stop at the fence line along Wilshire Bl. and in fact extend at least to the South side of the street. While still employed by the MTA as a Road Supervisor I received a call and responded to the South side of the street opposite the tar pits where oil and tar were seeping up into the street creating a traffic hazard. Have the engineers who surveyed and did soil samples as well as the scientists at the Tar Pits sight determine how deep and how far south the pits extend? It seems to me it will be very difficult if not impossible to tunnel passed the site as well as the damage it may cause to this scientific site. If said problems are discovered and an alternate route established the current excavation of the Fairfax Station may become useless. This would not be the first time design and construction by the MTA resulted in a poorly built facility that failed to meet the needs for which it was built. Hi, to answer your question. During pre-construction engineers worked with the museums to determine how deep and far the Tar Pits extend. The known Tar Pits do not extend to 40 feet below the surface which is where the top of the tunnel will be. Any tar pits that are under Wilshire Blvd. adjacent to Hancock Park will remain undisturbed. Also during pre-construction, a 65-feet deep exploratory shaft was also created to learn more about soil conditions in the area.